This course is offered during the "preclinical" or first two-years of medical school education. Working within the medical school’s integrated organ systems-based curriculum, this course attempts to accomplish a variety of learning objectives that cover basic communication, physical examination and critical thinking skills defined as core competencies. The two-year Doctoring curriculum shares the same block themes and, therefore, more fully inculcates the organ-system of study. 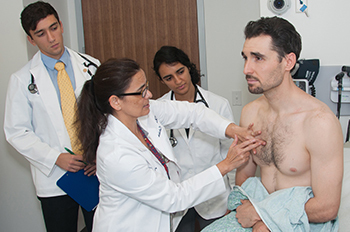 Each session is divided into modules, which typically include an orientation, live demonstration, physical exam practice, standardized patient (SP) encounter, focused SOAP note documentation exercise, oral presentation exercise and/or SOAP note dissection, vocabulary exercise, listening tutorial, a pathophysiology integration exercise and/or case summary. The purpose of this course is to allow students to practice new skills in a safe environment under faculty supervision. Students receive immediate verbal feedback from both SPs and faculty. This course meets every one to two weeks throughout the first- and second-year. Class sessions are formative, and the course grade is determined by an end of year OSCE (Objective Structured Clinical Exam) with SPs.